﻿ How Can Foreign Investors Participate in China's Education Market? China’s education market is now open to investments in the delivery of non-academic training-related services. It is the outcome of China’s recent education policy reform, which has made it attractive for providers of vocational training. This is positive when coupled with the increased spending on education by Chinese families. A significant segment of Chinese household spending is allocated to child education, with many spending upwards of RMB 50,000 (US$7,000) per year on extracurricular education for their children. Foreign investment in educational enterprises in China became easier since 2015 when “non-academic vocational skills training” was removed from the Negative List. This offered foreign entities greater market access in their investment forays into China’s education sector. The Chinese education market continues to grow and is worth around RMB 2 trillion (US$288 million). However, the areas of education open to foreign investment, overall, are still limited and account for a small fraction of the sector’s total market value. In any case, as China marches toward building a service economy, education will remain the deciding factor for many young people as they enter a highly competitive workforce. Jobs in high demand require skills ranging from technical and vocational skills in the hospitality and construction industries, through to knowledge skills, such as software, financial, and customer facing capabilities in the expanding information technology (IT) and IT-enabled services (ITeS) and financial services sectors. In short, Chinese parents take education seriously to the extent that they invest heavily in education and extra-curricular programs. A decent qualification in hand yields better job opportunities for students beyond graduation. Parents’ attitudes to education generally revolve around: making financial preparations; considering postgraduate studies; considering studying abroad; paying for private tuition; considering online programs; and reducing leisure expenses in favor of investing in education. Want to Know more about China's Education Industry? One other unique factor influencing China’s education market is that Chinese parents are acutely sensitive to social status. This in turn results in the association of the parent with a foreign teacher or school, or access to a higher level of status. This value proposition alone can be a recipe for wealth in China. As long as this crossover exists, status incentivizes foreign investors to provide education services. Social status can be equally or more valuable than the education itself in some cases. This view of education means that some providers more closely resemble for-profit companies rather than an environment for building worthwhile skills related to the workplace and life. An eye solely on profits has lead to lax standards within certain schools. Recent scandals involving private schools across China have raised questions of safety and education quality in the minds of Chinese parents. Issues of child safety have been answered with the installation of live camera feeds to survey classes in progress. Issues of quality are being met with policies aimed at attracting foreign education providers to resolve the unmet needs of consumers. Education stages in China closely resembles education in Western countries. Compulsory education from ages five to 16 years takes students from kindergarten to the end of middle school (in China secondary schooling is divided into middle and upper high school, much like in the US). The majority of students will continue their education at this point in one of two directions. The first is a standard high-school, where they will prepare for the demanding gaokao university entrance exams. The second is a vocational high-school, with a focus on honing technical skills. 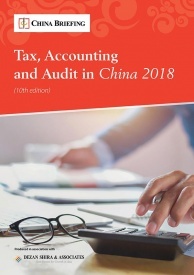 Foreign-controlled enterprises are prohibited from delivering the compulsory portion of education in China. The one exception is the schooling of non-Chinese students aged five to sixteen years old. For example, kindergarten to middle-school education provided to the children of expatriates in China would be permitted. 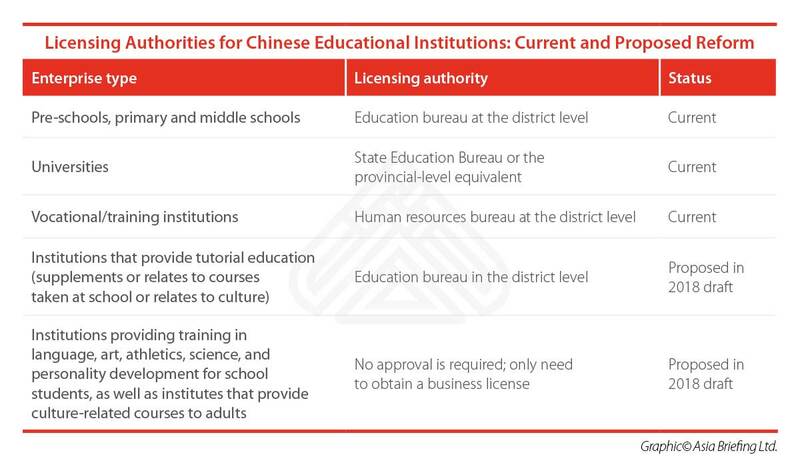 Apart from the heavily-controlled schooling segment, the remaining segments of the China’s education market are open to joint ventures and wholly-foreign owned enterprises (WFOEs). As the table below shows, joint ventures involve a foreign share of less than 50 percent. The ventures that allow full ownership by foreign investors relate to non-academic training. This refers to: language training, sports, and vocational skills. Such training centers must be run in a permitted zone, which for the time being is only within the Shanghai Free Trade Zone (FTZ). A recent trend in China is the adoption of online education. The online education market generated around RMB 68 billion (US$10 billion) in Q1 of 2018, which was a slight drop from the end of 2017. The leading categories of online education are primary/secondary education and childhood education. Foreign language learning is also popular. A good example is the online English school VIPKid. Their model is simple. Outside of China there are numerous suitable teaching staff available. They connect these teachers to learners within China via video call. The overheads are low, and the learners and their parents derive some form of value from the transaction. The arrangement cleverly matches valuable resources to paying customers. It removes a range of issues from the equation. 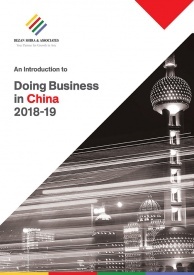 For example, the difficulty and costs associated with establishing an enterprise in China and the need for visas for teaching staff coming to China are completely avoided. For now, this sub-market remains unregulated. It is also unclear if online education is a suitable substitute for younger learners. Regardless, there is a growing market for online classes and the competition is fierce. It may be wise to hold out until the industry standards become clear before committing to market entry. Fortunately, the average Chinese consumer seems to be rather predictable in what they value in education. Parents gravitate towards options that deliver on perceived value. 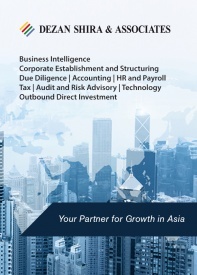 Foreign investors may be able to capitalize on the value associated with foreign-supplied education and on subjects that have high market demand or vocational value.